Sometimes it is the most simple designs that make the biggest statement. When it comes to first glances of the Regal 29 OBX there is nothing that will blow you away or stop you in your tracks. But when you spend a little extra time on it, you’ll be saying the words “wow” or “I really like that” quite a lot, and when you’re done you will certainly be blown away. 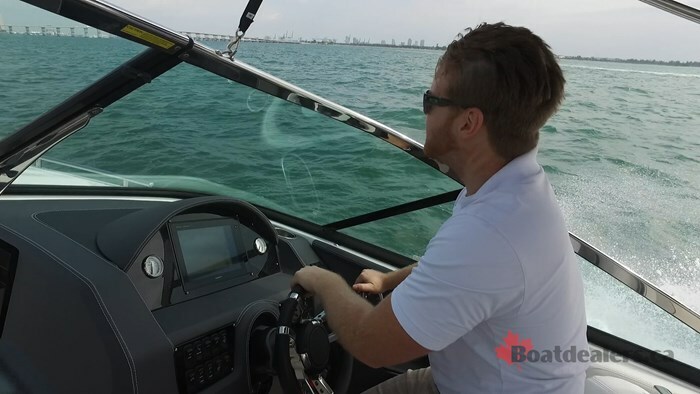 That was the case with me as I got to test the Regal 29 OBX at the Miami Boat Show. 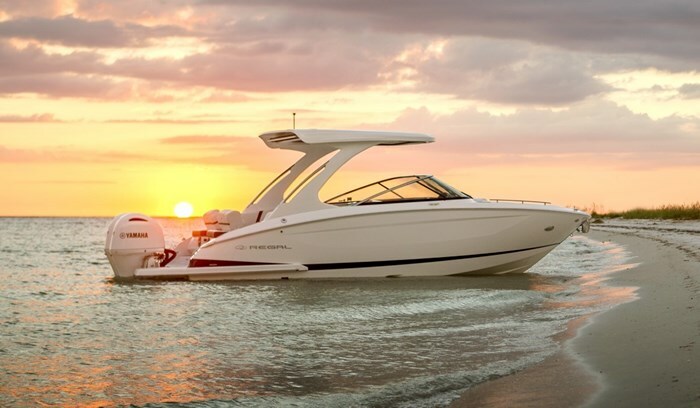 Part of an all-new, outboard powered line-up for Regal, the 29 OBX is the second biggest in this 5 model segment. Regal isn’t known for building outboard powered boats. But they are known for building high class, stylish boats that stand the test of time, so I don’t think the switch from sterndrive to outboard would really throw them for that much of a loop. 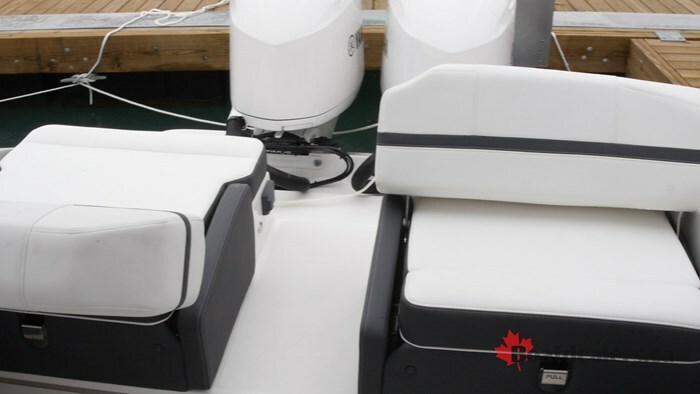 No matter what size of outboard powered boat you are building, the quandary is always that the outboards are going to take up prime real estate on your transom, so how do you make the most of this? 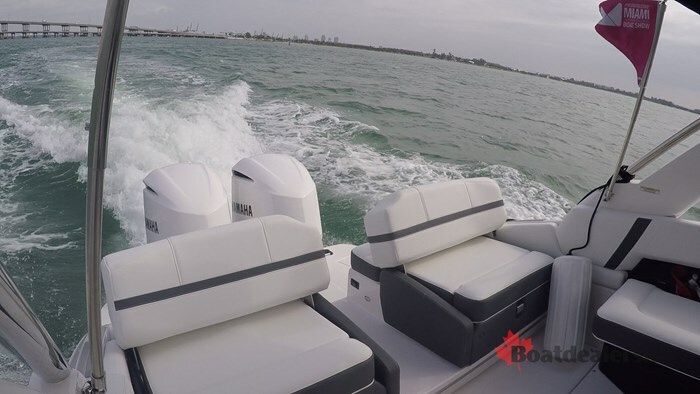 Regal does so by having the transom wrap around the outboards, giving you a large platform that makes boarding a breeze and provides ample room for impromptu cannonball contests. The simplicity I alluded to earlier was in regards to the cockpit seating arrangement of the 29 OBX. It’s an open arrangement, featuring two bench seat/loungers aft, bench seats both starboard and port, along with convertible Captain and companion seats. The layout, as seen from above, looks like two square brackets, but what it does for functionality is so much more. Regal calls this “Social Seating” and it’s a great way to describe it. It’s almost as if you’re at home in a large family room, conversing in a circle. However the 9-foot beam on the 29 OBX won’t make you feel cramped for space. 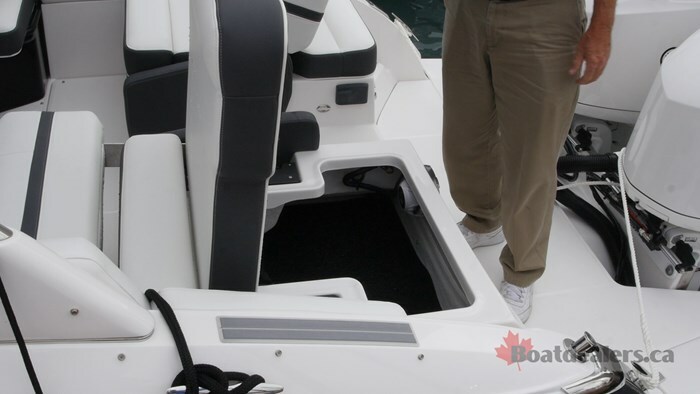 Should you require additional legroom, the entire aft seating section slides back over the platform an additional 10-inches to give you even more room. Those aft lounges are pretty special in their own right as they can act as cockpit seats, rear facing loungers or large flat sunbeds, all depending on what the need is at the time. And naturally under those large, plush cushions is tremendous storage. Speaking of storage, those two facing seats in the cockpit both hinge up to give you full access to the storage below. Rather than hinge towards the gunnels, the cushions instead hinge forward which gives you much more functional access. 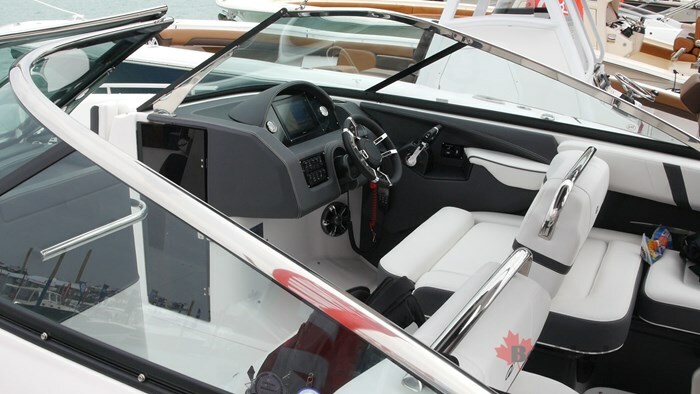 There are plenty of grab handles, drink holders and smart speaker placement to improve your time spent out on the water. Because in reality, that’s what this boat is - a large, functional day boat. At 29-feet 1-inch, it’s not the largest bowrider I have ever tested but it is quickly becoming one of the most impressive. When it is time to chill out on the hook, or beached on a remote island, those Captain and companion seats can have their backrests in the forward position, giving you a truly social seating arrangement, but when it is time to cruise back to port, they flip back and you have seats that are wide enough two a pair of cruising couples to cozy up for that peaceful ride home. 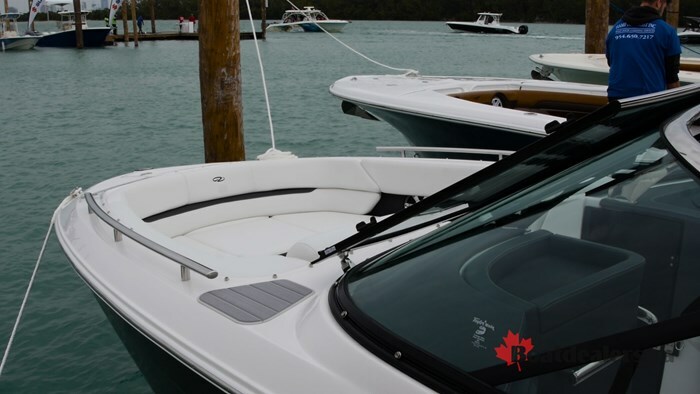 One of the benefits of having a 9-foot beam, is that you can offer a more traditional boat profile with a tapered bow and still offer a large bow seating arrangement. Lately builders have been going with either deck boats or blunted nose designs to utilize space in the most popular spot in the boat, but with that supersized width, even with a taper there’s still lots of space. It features a full lounge on the port side and a lounger on the starboard side that has a removable cushion, should you wish to face forward with your feet in the floor. There’s plenty of cup holders, speakers, grab handles and there’s plenty of depth to give you peace of mind should all the kids want to sit up there. Finally, what would a large family day boat be without a day head. I always think heads on day boats are more of a novelty than anything. I see folks at boat shows that are excited that the boat has one, but I often wonder what the percentage of those who use them are. Usually they’re a little cramped and dark. But the head on the 29 OBX was comfortable to sit in, bright thanks to a courtesy light and airy thanks to a sizeable porthole. There was nice touches, obviously taken from Regal’s larger boats, like the faux wood grain accents and the glass basin sink. I always like reviewing boats at the Miami show because it is one of the only shows where you can get out on the water with the new boats. Powered by all white, twin Yamaha Outboards totaling up to 400 hp I knew we were going to be in for a treat. The 29 OBX is rated for a max horsepower of 500, but the twin 200 Yamahas that we had on the back of this boat are actually part of a new 4-cylinder line that packs plenty of power into a package that probably weighs less than I do during the holiday season. It was a particularly pleasant February day in South Florida. It was sunny, about 20 degrees celsius however there was a strong wind out of the west. So when we cleared the under causeway we were met head on with a sizeable chop for testing. It was time to see what this boat could do in the rough stuff. As we put the throttles down the twin Yamahas jumped to life and powered the surprisingly lean 6,500 pound boat to plane in just under 4 seconds. Once on plane it was clear the Fastrac hull was ready to go to work. One nice thing about Regal’s famed hull design is that it is not dependant on trim. So you can still get the most out of the boat as the vents in the hull push air under the boat, making it ride up on top of the water. Even in the chop and the wind, the boat felt secure. There is no hiding any flaws in a boat when you’re running into a steady chop. Eventually something will come loose and begin to bang or rattle, but this was not the case with the 29 OBX. It felt strong, it felt secure and well built, like a Regal would. Finding a calm, protected spot we were able to hit a top speed 59.6 mph at wide open throttle and the Yamaha recommended RPM limit of 6000. Cruising speeds at 3500 RPM produced 29.1 mph and 4000 produced 36.3 mph. All of these numbers would be plenty for any family. This boat isn’t about performance, but it’s always nice to know you can get home in a flash or push through the rough water should it cross your path.